The Bachelor of Business Administration in Human Resource Management is a three-year programme. Applicants can apply for admission to Senior Year. This programme aims to help students understand the theoretical aspects of human resource management and apply them to employee relations, training, and development in real-life settings. 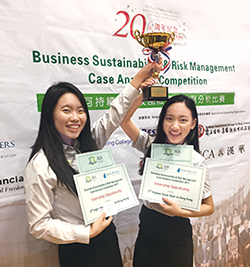 A team of two OUHK Business students participated in the Business Sustainability & Risk Management Case Analysis Competition 2017 organized by the Association of International Accountants (AIA) and came in second among 18 universities from Hong Kong, Macau and Mainland China.